Cut turn-around time and shrink schedules with automatically generated Accellera SystemC TLM 2.x models of your specific interconnect configuration. Arteris FlexNoC Interconnect SystemC TLM models are automatically generated based on the end-user's specific interconnect configuration. The models are used within FlexNoC's FlexExplorer module for quick turn-around script- and scenario-based performance evaluation and have associated Accelera IP-XACT descriptions. These models can also be exported from FlexNoC for easy import into system-level modeling tool suites like Synopsys Platform Architect, and are created at 3 levels of abstraction. 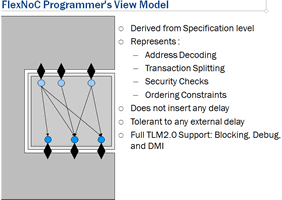 FlexNoC Programmer's View models are derived from the interconnect's Specification level and represent Address Decoding, Transaction Splitting, Security Checks, Ordering Constraints. They have full TLM 2.x LT support for blocking, debug, and direct memory interface (DMI). 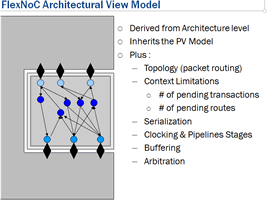 FlexNoC Architectural View models are derived from the interconnect's Architecture level, inheriting aspects of the PV model while also representing Topology (packet routing), Context Limitations (# of pending transactions, # of pending routes), Serialization, Clocking & Pipelines Stages, Buffering and Arbitration. 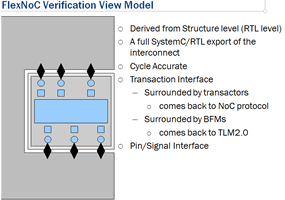 FlexNoC Verification View models are derived from the interconnect's Structure/RTL level. They are TLM 2.x Cycle-Accurate and can have a transactor/bus functional model (BFM) interface or a pin/signal interface. Arteris was twice listed on Inc. 500's list of America’s fastest-growing private companies, first in 2012, then 2013.